How to Get Away With Murder opens its third season with a dead body on a stretcher being rolled into an ambulance. Who is it? Where are we? What happened? We’re given hardly any information, but “We’re Good People Now” wastes no time rushing into what appears to be our season-long mystery. We cut to Wes being interviewed by police about the murder of Wallace Mahoney, his biological father. In last season’s finale, Wallace was murdered right in front of Wes, moments after he introduced himself. After some tough questions and a couple of white lies, Wes leaves the interview and hops in the passenger side of Annalise’s ride. A flashback reveals that Frank picked up Wes (does our hero not know how to drive?) and took him to his father’s office building, where Frank convinced him to approach his father. Let’s be real: Frank is probably the man behind the bullet that killed Wallace. And with that, the cliffhanger that seemed like it would be a huge part of season three already seems to be resolved. What a letdown! I expected more from HTGAWM. Annalise tells Wes that Frank killed Wallace to make up for killing her child, and that neither man is worthy of their grief. Annalise leads Wes into the woods where she lets out a deep bellow, and Wes joins in, allowing himself a rare moment of catharsis. Fast forward four months to the beginning of the school year, which will be this season’s present-day timeline. The Keating Five are reunited in Annalise’s lecture hall before their first class, and throughout the episode, flashbacks reveal how each of them spent their summer breaks. Back in May, Laurel tells Annalise that she will be spending her summer in Mexico. Annalise worries that she’s hiding a secret getaway with Frank, but Laurel is adamant that she is not. After Annalise demands that Laurel choose between her and Frank, Laurel swears her loyalty. She’s probably got her fingers crossed behind her back, though, because she’s still calling Frank in the present day. She’s unable to reach him directly, but that vow is broken regardless. In June, Annalise meets with Connor. He informs her that Oliver is going to ask for a job, and requests that she not hire him. Annalise agrees, in large part because Connor is too good for their line of work. But when Oliver meets her to discuss employment, he impresses with his hacking skills. Oliver adds that he’s done some hacking to intercept Connor’s transfer acceptance letter from Stanford, then did even more hacking to hide the follow-up call that would inevitably come thereafter. That definitely won’t come back to bite him. Nope, not at all. In July, Asher, now fatherless and estranged from his mother, does not have the money to pay for his tuition, so he demands a loan from Annalise. After laughing in Asher’s face, she suggests he get a job. In the present day, we see that Asher has taken a job as resident adviser and lives in a dorm with undergraduate students. He and Michaela are still sleeping together, but she doesn’t seem too pleased when their alone time is interrupted by Asher’s young advisees. August is rough for Michaela, who has to be saved from a DUI arrest by — who else? — Annalise. Michaela is still trying to cope with the trauma of last season, and has been self-medicating with alcohol. Instead of being grateful, she lashes out at Annalise for lending a hand. Annalise reminds Michaela that she is tough and brilliant; she still has faith in Michaela’s strength to handle whatever will come. We’ll see about that. August is hard on Annalise, too. She meets the new university president (played by Lauren Vélez), who informs Annalise that she’s been relegated to a research position and will no longer be teaching Introduction to Criminal Law. (But how will the kids learn to get away with murder?) It turns out that the Keating Five placed in the lowest 10 percent of their class — an unacceptable mark, as far as the president is concerned. This seems like a rather extreme reaction to a single underperforming year, given Annalise’s history, but new boss, new rules. She talks the president into letting her run a legal clinic, where her students can work as pro bono criminal lawyers. This doesn’t seem very different from what Annalise was doing before the demotion, but the president goes along with it, and I guess we’ll be doing the same. And then there’s Wes. At some point during the summer, he apparently threw himself into a relationship with an unseen woman named Maggie. The speed with which their relationship progressed clearly disappoints Laurel, whom he runs into outside Annalise’s lecture in the present day. When Annalise enters the classroom, she explains that the students will behave as lawyers this year. It won’t be a cakewalk: They will have their own cases and clients, they will compete for first and second chair, and Annalise will supervise every case. “You finally get to be me,” she announces, which isn’t the most attractive offer given the horror show the last two years have been. Just as she says those words, she notices the looks of horror on her students’ faces. Following their eye lines, the camera lands on a photo of Annalise and the word “KILLER” typed in bold red print above her head. It’s pretty creepy. Unfazed, Annalise rips down the poster and gets back to business. The class’s first client is Karim, an Iraqi refugee who recently served time for marijuana possession and faces deportation. Annalise asks the class for strategies to help defend against the deportation. As soon as class lets out, though, the Keating Five approach Annalise to express concern over the “killer” poster. Annalise tells them not to worry. “We’re good people, now,” she says. Sure, if “good” means “we haven’t killed anyone in, like, four months.” If the season commits to this idea, it will be interesting to watch. 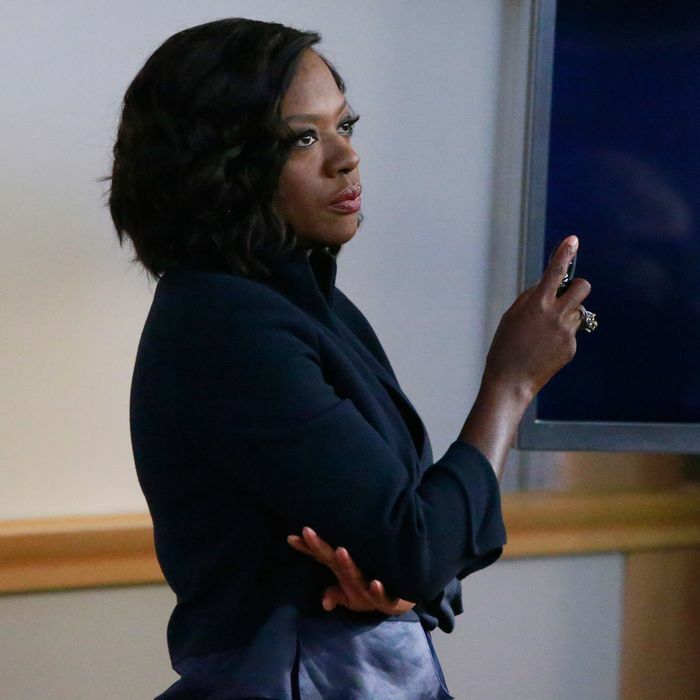 Can Annalise and the Keating Five be “good people” as the world burns down around them? At home, Annalise grabs burner phone hidden in a jewelry box in her bedroom. She texts an unknown number, which responds with news about a “lead,” along with an order to keep her phone close. Wes and a know-it-all Keating Five hater named Drake win the chance to be first and second chair on Karim’s case. At the deportation hearing, Michaela rushes into the courtroom in the middle of Wes’s defense presentation — she’s found evidence that Karim’s public defender in the original case had been ineffective counsel. Annalise immediately fires Drake and names Michaela second chair. Armed with this new information, she heads out to negotiate a deal for Karim. His charges are reduced, but unfortunately, Annalise and company cannot stop his deportation. In spite of her promise, Annalise tells Connor that she wants to hire Oliver. She notes that Oliver isn’t as innocent as they both believed, revealing how he covered up the Stanford hack. That night, Oliver tells Connor that he’s accepting the job with Annalise. Connor confronts him about the Stanford hack, then forgives him when he comes clean. Oliver, not content to accept this blessing, becomes angry with Connor for not being disgusted by this betrayal. Oliver decides that he is unhappy with who he has become; he needs time to figure himself out … alone. Connor and the rest of us watching on our couches are shocked. Good luck figuring yourself out, Oliver. Working alongside your ex-boyfriend for a conniving manipulator like Annalise Keating isn’t exactly where I would start my journey of self-discovery, but to each his own. Later, Laurel confronts Wes at his apartment to demand answers about their strained relationship. He admits that he associates her with Frank, and because of that, he can’t be close to her. They’re interrupted by Wes’s girlfriend Maggie, who is very real and a big hugger. Maggie has heard all about Laurel, and envelopes her a supremely awkward hug. Annalise finally gets a call on her burner phone. A private investigator tells her that he has located Frank, now without his glorious beard (RIP) and sporting a buzz cut. The PI asks Annalise what she wants him to do. She hesitates, presumably to contemplate what a good person would do in this situation, and overhears Frank overtake the PI and kill him. We flash forward two months, returning to the ambulance from the season’s opening scene. We learn that the body on the stretcher came from Annalise’s house. She fights her way into the ambulance, lifts the sheet, and breaks down in tears upon learning who died. And then when she turns around, her house is on fire. This “good” thing isn’t working out for too well for you, Annalise. Yet another person in the Keating orbit turns up dead, and we’re off to a new season of twists and turns. Who do you think the latest victim is? My guess is the university president, even though I’ll be sad if she leaves anytime soon. You wouldn’t bring in a spectacular guest actress like Lauren Vélez without letting her go out with a bang, right?